From the outset it was apparent that the American Expeditionary Force (AEF) would have to build its own logistical network in France; up to 25,000 tons of material would be arriving every day, and by war’s end over eight million tons had been shipped to the AEF. Port facilities had to be built or improved at Brest, St. Nazaire, Nantes, Bordeaux, Rouen, Rochefort, La Pallice, Bayonne, Le Havre and Marseilles. It was also clear that the French rail system wouldn’t be able to move the AEF and its logistical tail around the country. Among other things, they were very short of locomotives. The necessary solution was to bring American railroad equipment to France. The Baldwin Locomotive Works was contracted to supply 1,500 locomotives, and after testing and acceptance these had to then be disassembled and crated for shipment, a process which took several days. Even with economies of scale, as all of the units were identical 2-8-0 engines, inevitably called ‘The General Pershing’ Class, there were serious delays in reassembling them in France. At first the average time to get a disassembled locomotive in operation after arrival was thirty-three days, but this increased due to the large number being received and the inevitable mixing-up of crates. This problem landed in the lap of Samuel Morse Felton Jr. (1853-1930), who had been appointed the Director-General of Military Railways. He was the son of a pioneer railroad builder, an 1873 graduate of the predecessor of MIT and had spent his life in American railroading, finishing as the head of the Chicago Great Western Railroad. 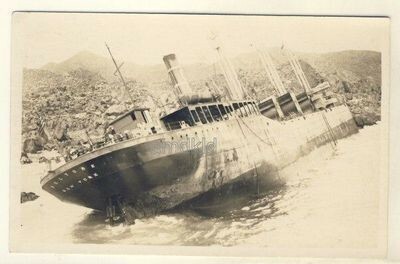 the S.S. Firmore, post-war history unknown. They found a derrick at Sparrows Point, Maryland capable of dead-lifting the 75.5 ton locomotives. The first shipment was loaded on the Feltore on April 30th, 1918. Thirty-three locomotives and their tenders, essentially ready for steam, were placed in the hold of the Feltore, with bales of hay wedged around them to keep them from shifting. The shipment arrived at St. Nazaire without incident. By this means, the time required in getting a locomotive in operation after its arrival in France was reduced to eight hours. 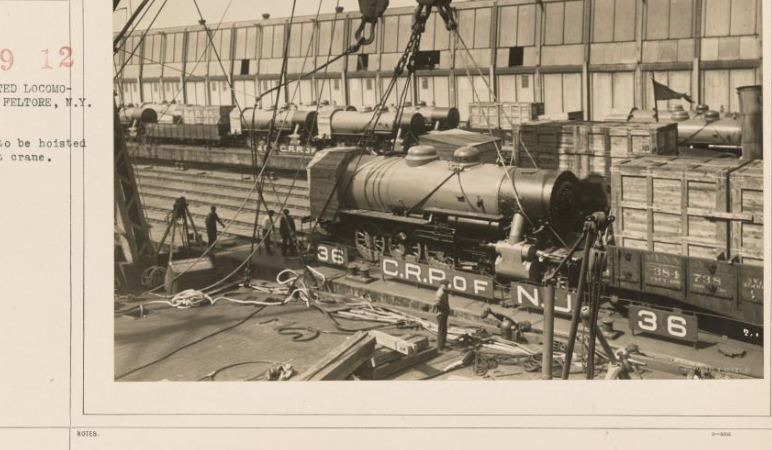 Later an improved stowage plan made it possible to load thirty-six locomotives and tenders in the holds of these four vessels, and Felton’s staff requisitioned another twelve ships capable of holding the units on their wheels, although not as many as in the ore-carriers. Today there are two (possibly three) of the General Pershing locomotives left and only one is operational. During WW1 this particular unit was used in the Army’s marshaling yards in New Jersey and today runs as a tourist attraction between Rusk and Palestine in Texas.